BISSELL is a family owned company that has been a leader in the homecare business for over five generations. BISSELL has a deep commitment to understanding the lives and cleaning needs of their consumers. That fundamental belief leads BISSELL to researching their home environments and cleaning habits. This gives BISSELL the foundation to develop inventive home cleaning solutions, and provide true innovations that are inspired by real life. BISSELL’s associates are dedicated to providing superior service, because our professionals are passionate to be the best for you. That’s tradition, innovation and passion. This is BISSEL’s past, present and future. In 1876, a cleaning revolution took place in the U.S. Melville R. BISSELL and his wife, Anna, owned a small crockery shop in Grand Rapids Michigan. Because they were constantly cleaning sawdust off the carpet of the shop, Melville invented a unique carpet sweeper and patented it. When customers and friends began asking where they could buy the carpet sweeper, a new business was born. When Melville BISSELL died in 1889 his wife Anna stepped in to lead the business, becoming the first female CEO in America. She aggressively defended the company’s patents and marketed sweepers successfully throughout North America and Europe. In fact, in the late 1890s BISSELL gained its biggest fan in Queen Victoria, insisting that her palace be “BISSELLed” every week. In 1956, the manual carpet shampooer was introduced, which rendered the practice of scrubbing carpets on hands and knees. By the end of the 60s BISSELL offered the first combination Vac/Floor scrubber, Dry Powder Rug Shampoo and Applicator, and the Gemini Sweeper, the first two-brush sweeper. In 1979, the first BISSELL carpet deep cleaning machine was introduced, making dirty carpet easily disappear. Then, in the late 1980s the company’s first deep cleaner that was no longer tethered to a water source in the house was created. As a result, carpet deep cleaning became more effective and convenient than ever, and that’s the path BISSELL has continued on ever since, creating the BISSELL Big Green Clean Machine® and the PowerGroom®, the first BISSELL-branded upright vacuum in the 90s. In 2005, the SpotBot® portable deep cleaner was introduced, the first product designed specifically for cleaning up after pets. Under the leadership of Cathy BISSELL support was given to the pet community through contributions to U.S. pet charities. And, in 2011, she founded the BISSELL Pet Foundation, a non-profit organization that advocates for lost, abused, neglected and abandoned pets by raising funds through the sale of BISSELL pet products. 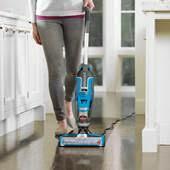 BISSELL is a family company specializing in floor cleaning for over 140 years. Our mission is to develop clever cleaning solutions for truly clean floors of every kind. Our patented technologies for wet and dry floor cleaning will help you to achieve the highest cleaning standards effortlessly, so you can have peace of mind after cleaning and enjoy your family time to the fullest. ‘As a global company and brand our values are critical. They are the foundation of everything we are and want to be. It’s what makes us tick, now and in the future. They define why we exist, where we want to go, and how to get there, behaving according to our personality and those values’. Teamwork is the foundation of Bissell’s global success. Besides this, the values and heritage of BISSELL as a family owned company define the Global Bissell Culture. BISSELL fosters people who are competent, down-to-earth, committed and enthusiastic. Bissell International Europe is in the process of getting from a start up to a scale up. Which means that BISSELL is growing faster than the infrastucture can handle at the moment. This brings a more intuitive way of decisionmaking. Further professionalization and structuring will be part of the process as well as defining the culture in the Amsterdam office. The desired culture in the Amsterdam office can be described as varied, open, direct, enthusiastic, open minded, flexible, curious, pragmatic, not corporate and entrepreneurial. Develop a trade marketing vision or plan for assigned area and ensure implementation and execution of this strategy / plan, in line with the commercial policy and BISSELL International ambitions, in order to influence customer purchasing behaviour towards BISSELL, increase distributor and customer satisfaction and achieve commercial plan. Develop (or contribute to the development of) a vision on trade marketing for BISSELL, based on analysis and commercial strategyand input from Marketing and Sales. Draw up and report on an operational plan and activity plan for assigned area including concrete objectives as well as produce regular updates, based on approved vision and in agreement with other Sales and Marketing departments. Collect, interpret and process data (or ensure that this is done) concerning developments and trends with regard to the categories/channels, the buyer and the competition within the assigned area. Select (or contribute to the selection of) the most attractive market channel based on economic value, brand opportunities and strategic alliances. (Define and) optimize product portfolio based on local market needs, identify new product opportunities and assist customers/sales in the selection of product assortment. Build and execute trade communications plan (exhibitions, print, online and offline media, sales presentations) as well as activation programs. Plan, organise and implement/carry out the activities defined in approved plans (or ensure that this is done), partly by coordinating activities aimed at the Marketing and Sales departments (including providing sales support in the form of presentations, market approach and brochures), as well as champion the communication and alignment processes with key stakeholders. Measure, monitor and evaluate the activities that have taken place and make improvements based on this. Design and develop concepts and activities aimed at activating the point of sales as well as to come up with initiatives and make recommendations with regard to improvements, in line with the approved trade marketing plan and in cooperation with the Sales and/or Marketing departments. Out of own area of expertise, contribute to the realization of internal projects, as project leader, -member or –expert. Hire, coach and direct employees and manager, appraise and develop (the cooperation between) employees of the own department/discipline using the instruments, service and procedures of the HR department. The international Trade mraketing Lead leads the Trade Marketing team (3 direct reports). This role reports to the Commercial Director in Amsterdam. Level of problemsolving: innovate. Solves complex, abstract issues for own focus area, for which context thinking and vision are necessary. Anticipates and acts on changing demands in the environment. Can influence and engage people for changes in own focus area. Required skills or training: MS Office, excellent presentation skills. Stress Management, the ability to perform under pressure and in adversity. Controlling Progress, the ability to control the progress of employees’ processes, tasks, or activities and of one’s own work and responsibilities.